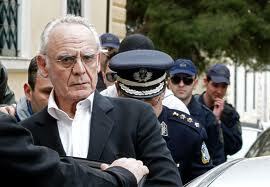 Former defense minister Akis Tsochatzopoulos, convicted to 20 years in prison for money laundering in 2013, will be held in prison just a few more days after raising 200,000-euros in bailout money ordered by an Athens appeals court. His release was initially set for Friday but has been delayed due to bureaucratic reasons. Originally, an appeal requesting the former minister’s bail be reduced was rejected, while his lawyers argued that he only managed to collect 50,000 as all his bank accounts have been seized. However, the 200,000 was eventually raised by relatives and friends. Tsochatzopoulos, 77, has been in poor health since he underwent triple bypass last month and his lawyers insist that keeping him in prison is putting his life at risk.